REA to PWCC Mathewson...any thoughts? 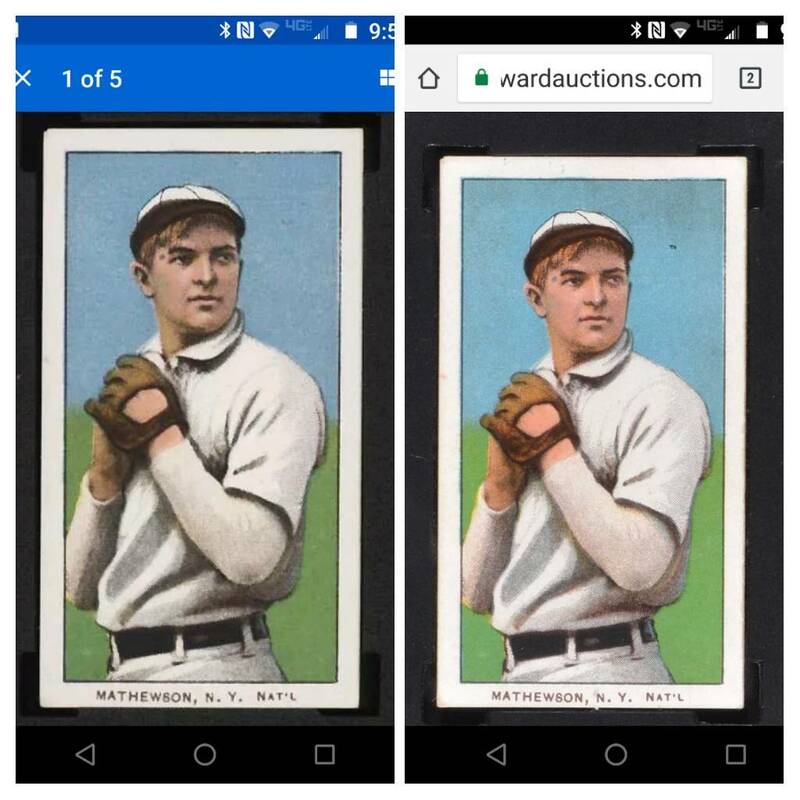 Searching through PWCC's impressive listings I noticed a Mathewson White Cap SGC 6 I had bid on a REA as a 5.5? I know the PWCC pic quality is not the same so just curious what other people think. I think its the same card that has been cleaned up a bit. That top left corner looks exactly similar as does the way the blue intersects the black border on the top right of the card. Border measurements look the same as does the way the lettering of the name and team kind of slope down to the middle from the left then back up toward the right. The rea card has a smudge at the top of the N in N.Y. that isn't on the PWCC card or at least doesn't appear to be and the small paper piece below the N in the rea card has been removed. Bottom line I think its the same card that has been cleaned up. Last edited by iwantitiwinit; 09-02-2018 at 06:12 PM. I'm glad someone else thinks it was cleaned a little. I was mostly comparing the notch in the upper left corner. The left side indent appears smaller in the PWCC listing and equal distance from the top. Where the notch in the REA listing appears twice the size of the distance from the top. REA one has a mark in the upper right quadrant, PWCC one doesn't appear to. I was looking at that mark also but if you look closely at the PWCC card you can see a slight outline in the same place. I think it was there, I think its been cleaned. I think its the same card. Also look at the reverses of both cards there is that same space in the top line of the printing and all the other anomalies line up. I'd love to know who consigned this card. Who cleaned it. Last edited by iwantitiwinit; 09-02-2018 at 07:11 PM. I was looking at that mark also but if you look closely at the PWCC card you can see a slight outline in the same place. I think it was there, I think its been cleaned. I think its the same card. Maybe the person who cleaned it is the one with 16 bids on it so far. Those are legitimate bids by a valued customer. Yep, that spot on the temple isn't on any other white cap I can find. Also like some notice that top left corner of the card has the same little tip out of it. Definitely cleaned but Is that ok ? Does that count as being altered ? Last edited by Solemany2k; 09-02-2018 at 09:01 PM. It could be the scans, but if those are the same setting, the cleaning resulted in a loss of some vibrancy IMO. my problem is it looks like it was cleaned digitally. look at the odd pixel texture where the dot was in the blue field. Great catch Larry! Definitely the same card, but it’s very curious if someone cleaned it- the guy cracks out an SGC 5.5, alters the card, and then resubmits it back to SGC, who then bumps it .5. You know with that corner, the spots on the card and the bad OC back, it wasn’t getting that much of a bump at all (6 at most), with the risk that it gets an A. Seems to me the juice isn’t worth the squeeze on cracking and messing with the card. I like the theory that it’s in the pictures/scans/pixels. But nevertheless, whatever happened, it resides in an SGC 6, so they bumped it, either as a raw submission or on review. Last edited by Rhotchkiss; 09-03-2018 at 09:07 AM. If PWCC's scan is all but hiding that significant mark in the upper right quadrant that's pretty worrisome. I agree. It now looks pale/washed out compared to the original. Also, there is an indent/line to the right of his cap that is clearly visible but not so much in the second scan/pic. Could just be the scanner setting making everything look different but I believe the card has also been cleaned rather than just resubmitted. Much of the difference is likely due to different settings in the scan. If you look at some minute details like the small dark spot on matty's left elbow it becomes apparent that the differences in vibrancy/color are not likely the result of a cleaning. If they were, why would a small dark spot on matty's left elbow point (typical for this card) appear after a cleaning? The scans produced a dark rendering in the sgc 6 holder. As for the spot in the upper blue quadrant, it is possible that this was residue on the card that sgc removed before putting it in the new holder if that was requested by the customer. Upshot is different settings likely caused the majority of differences in the image of the card, and whether or not it has been cleaned is inconclusive. Why this is PWCC High End is the biggest surprise to me? It's a questionable 6 given the top left corner and has some surface and centering issues that impact the eye appeal of the card. Why a high end 6? Maybe Brent bought it? Either way it certainly devalues their label of high end. I think this is just another bad mistake by the experts at PWCC. Last edited by Aquarian Sports Cards; 09-03-2018 at 03:36 PM. Why are people buying into a high end sticker for cards that aren’t high end? I would have respect for it if it actually was legit. It’s really poor form on PWCCs part. I hope the board hears from Brett or Betsy in regards to the t206 Matty high end with stock loss on the upper left corner. I am sure there’s a great explanation for this. Maybe the black mark and smudge was on the slab and not the card. Slabs get dirty and dinged up all the time. Just closed for $4,551. Last sold at REA in its SGC 5.5 flip for $2,700 on 5/6/18. 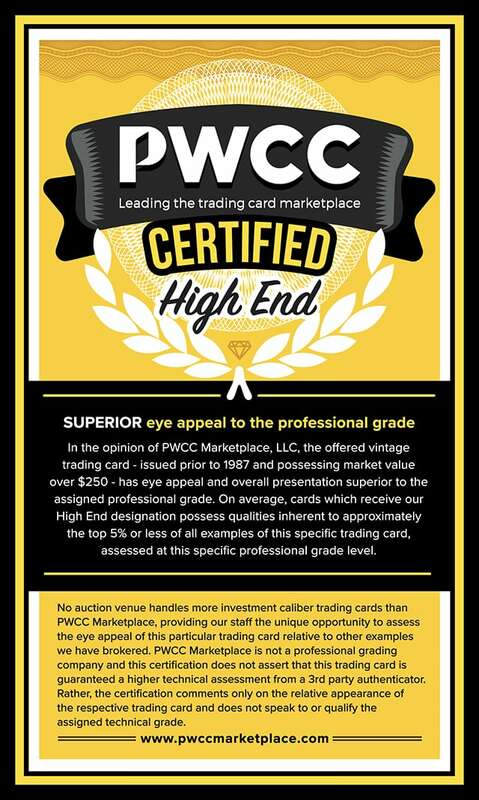 In four months, the card goes from an SGC 5.5 worth $2,700 at REA, to an SGC 6 flip sold for $4,500 in a PWCC auction, in which PWCC says is High End. Wow. Along those lines, anyone see the E102 Cobb SGC 4 that went for $17k+!! It is a gorgeous card, but it closed for more than double what I had it worth. Pretty low end for a 6, is there a sticker for that? Also, low end stickers will exhibit wrinkling, border damage and noticeable wear to the surface gloss, issues which many collectors frown upon when searching for graded card stickers to add to their collection. Now it's "buy the sticker" not the holder! !